My gf and I went out for breaky and saw an amazing treat in the window… a raspberry and white chocolate tart… it was love at first sight but of course was full of dairy, cream, gluten, SUGAR and all the junk I don’t want. So, of course I went home and had to make my own variation of this deliciousness. I can’t even explain how yummy it is. 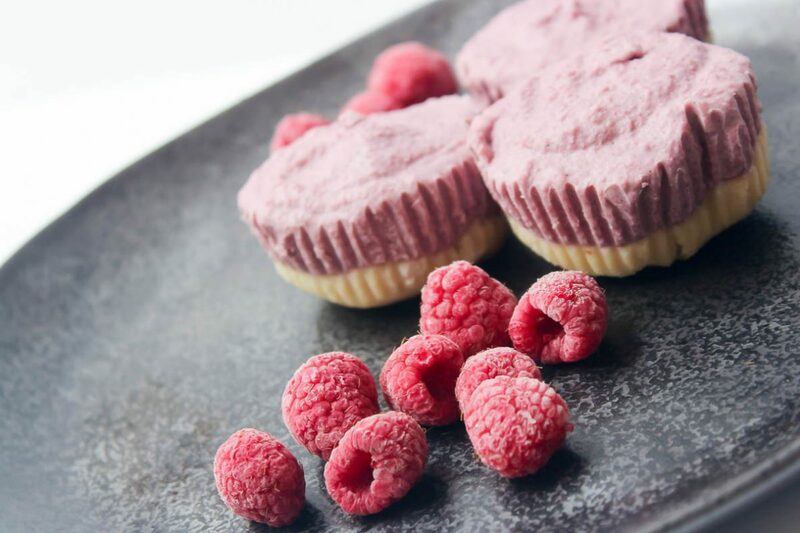 The raspberry makes it sweet enough that you don’t even need a sweetener – WINNING! Oh and also it doesn’t have any white chocolate it in… BUT you wouldn’t even know! It’s a balance of creamy, sweet and a soft crumb from the base. Perfect treat to have in the fridge or keep it in the freezer and whip it out when you want to eat one! These didn’t last long in my house haha the best part is you don’t even need to feel guilty about gobbling one down as they are jam packed full of nutrient dense ingredients. Almonds, Cashews, Coconut Oil, Raspberries and Cacao Butter! That’s it! Nothing refined, no crap- just good fats to make you feel full and the raspberries to concur your sweet craving. OK enough ranting and raving, I wish I could just slide snacks through a screen so you could taste these (one day- ill keep working on it haha) but to be honest you can whip these up so quickly. Once your nuts have soaked throw it all in the food processor and boom you’re done!! Enjoy this yummy vegan, paleo, sugar free, guilt free, wholesome bloody goodness! Add almond meal and coconut oil to food processer, until well combined. Press mixture into a tart pan (8-inch) or muffin tin. Noting this mixture will stick to the bottom if placed into muffin tin, place paper holders to remove easily. Refrigerate for 30 mins, or until firm to touch. Add cashews and macadamias to food processor, pulse to break down nuts. Add melted cacao, vanilla bean (rice malt syrup if using) mix until well combined. Add raspberries and continuing blending. Pour mixture into pan and refrigerate for approx. 3hours. Enjoy this amazing sugar free treat! !